"Wittelsbach" redirects here. For other uses, see Wittelsbach (disambiguation). Coat of arms (15th century), the Wittelsbach (Bogen) lozenges quartered with the lion of the Palatinate. The House of Wittelsbach (German pronunciation: [ˈvɪtəlsbax]) is a European royal family and a German dynasty from Bavaria. Members of the family reigned as Dukes of Merania (1153–1180/82), Dukes, Electors and Kings of Bavaria (1180–1918), Counts Palatine of the Rhine (1214–1803 and 1816–1918), Margraves of Brandenburg (1323–1373), Counts of Holland, Hainaut and Zeeland (1345–1432), Elector-Archbishops of Cologne (1583–1761), Dukes of Jülich and Berg (1614–1794/1806), Kings of Sweden (1441–1448 and 1654–1720) and Dukes of Bremen-Verden (1654–1719). The family also provided two Holy Roman Emperors (1328–1347/1742–1745), one King of the Romans (1400–1410), two Anti-Kings of Bohemia (1619–20/1742–43), one King of Hungary (1305–1309), one King of Denmark and Norway (1440–1447) and one King of Greece (1832–1862). The family's head, since 1996, is Franz, Duke of Bavaria. Berthold, Margrave in Bavaria (died 980), was the ancestor of Otto I, Count of Scheyern (died 1072), whose third son Otto II, Count of Scheyern acquired the castle of Wittelsbach (near Aichach). The Counts of Scheyern left Scheyern Castle (constructed around 940) in 1119 for Wittelsbach Castle and the former was given to monks to establish Scheyern Abbey. The Wittelsbach Conrad of Scheyern-Dachau, a great-grandson of Otto I, Count of Scheyern became Duke of Merania in 1153 and was succeeded by his son Conrad II. It was the first Duchy held by the Wittelsbach family (until 1180/82). Otto I's eldest son Eckhard I, Count of Scheyern was father of the Count palatine of Bavaria Otto IV (died 1156), who was the first Count of Wittelsbach and whose son Otto was invested with the Duchy of Bavaria in 1180 after the fall of Henry the Lion and hence the first Bavarian ruler from the House of Wittelsbach. Duke Otto's son Louis I, Duke of Bavaria acquired also the Electorate of the Palatinate in 1214. The Wittelsbach dynasty ruled the German territories of Bavaria from 1180 to 1918 and the Electorate of the Palatinate from 1214 until 1805; in 1815 the latter territory was partly incorporated as Rhine Palatinate into Bavaria, which Napoleon elevated to a kingdom in 1806. On Duke Otto II's death in 1253, his sons divided the Wittelsbach possessions between them: Henry became Duke of Lower Bavaria, and Louis II Duke of Upper Bavaria and Count Palatine of the Rhine. When Henry's branch died out in 1340 the Emperor Louis IV, a son of Duke Louis II, reunited the duchy. The family provided two Holy Roman Emperors: Louis IV (1314–1347) and Charles VII (1742–1745), both members of the Bavarian branch of the family, and one German King with Rupert of the Palatinate (1400–1410), a member of the Palatinate branch. The House of Wittelsbach split into these two branches in 1329: Under the Treaty of Pavia, Emperor Louis IV granted the Palatinate including the Bavarian Upper Palatinate to his brother Duke Rudolf's descendants, Rudolf II, Rupert I and Rupert II. Rudolf I in this way became the ancestor of the older (Palatinate) line of the Wittelsbach dynasty, which returned to power also in Bavaria in 1777 after the extinction of the younger (Bavarian) line, the descendants of Louis IV. The Bavarian branch kept the duchy of Bavaria until its extinction in 1777. The Wittelsbach Emperor Louis IV acquired Brandenburg (1323), Tyrol (1342), Holland, Zeeland and Hainaut (1345) for his House but he had also released the Upper Palatinate for the Palatinate branch of the Wittelsbach in 1329. His six sons succeeded him as Duke of Bavaria and Count of Holland and Hainaut in 1347. The Wittelsbachs lost the Tyrol with the death of duke Meinhard and the following Peace of Schärding – the Tyrol was finally renounced to the Habsburgs in 1369. In 1373 Otto, the last Wittelsbach regent of Brandenburg, released the country to the House of Luxembourg. On Duke Albert's death in 1404, he was succeeded in the Netherlands by his eldest son, William. A younger son, John III, became Bishop of Liège. However, on William's death in 1417, a war of succession broke out between John and William's daughter Jacqueline of Hainaut. This last episode of the Hook and Cod wars finally left the counties in Burgundian hands in 1432. Emperor Louis IV had reunited Bavaria in 1340 but from 1349 onwards Bavaria was split among the descendants of Louis IV, who created the branches Bavaria-Landshut, Bavaria-Straubing, Bavaria-Ingolstadt and Bavaria-Munich. With the Landshut War of Succession Bavaria was reunited in 1505 against the claim of the Palatinate branch under the Bavarian branch Bavaria-Munich. From 1549 to 1567 the Wittelsbach owned the County of Kladsko in Bohemia. Strictly Catholic by upbringing, the Bavarian dukes became leaders of the German Counter-Reformation. From 1583 to 1761, the Bavarian branch of the dynasty provided the Prince-electors and Archbishops of Cologne and many other Bishops of the Holy Roman Empire, namely Liège (1581–1763). Wittelsbach princes served for example as Bishops of Regensburg, Freising, Liège, Münster, Hildesheim, Paderborn and Osnabrück, and as Grand Masters of the Teutonic Order. In 1623 under Maximilian I the Bavarian dukes were invested with the electoral dignity and the duchy became the Electorate of Bavaria. His grandson Maximilian II Emanuel, Elector of Bavaria served also as Governor of the Habsburg Netherlands (1692–1706) and as Duke of Luxembourg (1712–1714). His son Emperor Charles VII was also king of Bohemia (1741–1743). With the death of Charles' son Maximilian III Joseph, Elector of Bavaria the Bavarian branch died out in 1777. The Palatinate branch kept the Palatinate until 1918, having succeeded also to Bavaria in 1777. With the Golden Bull of 1356 the Counts Palatine were invested with the electoral dignity, their county became the Electorate of the Palatinate. Princes of the Palatinate branch served as Bishops of the Empire and also as Elector-Archbishops of Mainz and Elector-Archbishops of Trier. After the death of the Wittelsbach king Rupert of Germany in 1410 the Palatinate lands began to split under numerous branches of the family such as Neumarkt, Simmern, Zweibrücken, Birkenfeld, Neuburg and Sulzbach. When the senior branch of the Palatinate branch died out in 1559, the Electorate passed to Frederick III of Simmern, a staunch Calvinist, and the Palatinate became one of the major centers of Calvinism in Europe, supporting Calvinist rebellions in both the Netherlands and France. The Neuburg cadet branch of the Palatinate branch also held the Duchy of Jülich and Berg from 1614 onwards: When the last duke of Jülich-Cleves-Berg died without direct heirs in 1609, the War of the Jülich succession broke out, ended by the 1614 Treaty of Xanten, which divided the separate duchies between Palatinate-Neuburg and the Margraviate of Brandenburg. Jülich and Berg fell to the Wittelsbach Count Palatine Wolfgang William of Neuburg. In 1619, the Protestant Frederick V, Elector Palatine became King of Bohemia but was defeated by the Catholic Maximilian I, Elector of Bavaria, a member of the Bavarian branch. 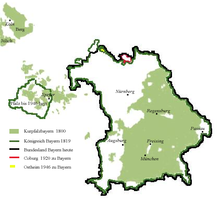 As a result, the Upper Palatinate had to be ceded to the Bavarian branch in 1623. When the Thirty Years' War concluded with the Treaty of Münster (also called the Peace of Westphalia) in 1648, a new additional electorate was created for the Count Palatine of the Rhine. During their exile Frederick's sons, especially Prince Rupert of the Rhine, gained fame in England. The house of Palatinate of Zweibrücken-Kleeburg as heir to the Swedish throne ruled simultaneously the duchy of Bremen-Verden (1654–1719). In 1685, the Simmern line died out, and the Catholic Philip William, Count Palatine of Neuburg inherited the Palatinate (and also Duke of Jülich and Berg). During the reign of Johann Wilhelm (1690–1716) the Electoral residence moved to Düsseldorf in Berg. His brother and successor Charles III Philip, Elector Palatine moved the Palatinate's capital back to Heidelberg in 1718 and then to Mannheim in 1720. To strengthen the union of all lines of the Wittelsbach dynasty Charles Philip organized a wedding on 17 January 1742 when his granddaughters were married to Charles Theodore of Palatinate-Sulzbach and to the Bavarian prince Clement. In the imperial election a few days later Charles III Philip voted for his Bavarian cousin Prince-Elector Charles Albert. After extinction of the Neuburg branch in 1742, the Palatinate was inherited by Duke Charles Theodore of the branch Palatinate-Sulzbach. After the extinction of the Bavarian branch in 1777, a succession dispute and the brief War of the Bavarian Succession, the Palatinate-Sulzbach branch under Elector Charles Theodore succeeded also in Bavaria. With the death of Charles Theodore in 1799 all Wittelsbach land in Bavaria and the Palatinate was reunited under Maximilian IV Joseph, a member of the branch Palatinate-Zweibrücken-Birkenfeld. At the time there were two surviving branches of the Wittelsbach family: Palatinate-Zweibrücken (headed by Maximilian Joseph) and Palatinate-Birkenfeld (headed by Count Palatine William). Maximilian Joseph inherited Charles Thedore's title of Elector of Bavaria, while William was compensated with the title of Duke in Bavaria. 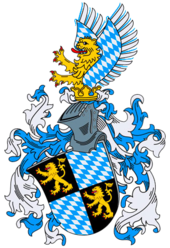 The form Duke in Bavaria was selected because in 1506 primogeniture had been established in the House of Wittelsbach resulting in there being only one Reigning Duke of Bavaria at any given time. Maximillian Joseph assumed the title of king as Maximilian I Joseph on January 1, 1806. The new king still served as a Prince-elector until the Kingdom of Bavaria left the Holy Roman Empire (1 August 1806). Under Maximilian's descendants, Bavaria became the third most powerful German state, behind only Prussia and Austria. It was also far-and-away the most powerful secondary state. When the German Empire was formed in 1871, Bavaria became the new empire's second most powerful state after Prussia. The Wittelsbachs reigned as kings of Bavaria until 1918. On 12 November 1918 Ludwig III issued the Anif declaration (German: Anifer Erklärung) at Anif Palace, Austria, in which he released his soldiers and officials from their oath of loyalty to him and ended the 738-year rule of the House of Wittelsbach in Bavaria. The republican movement thereupon declared a republic. During the Second World War, the Wittelsbachs were anti-Nazi. The family initially left Germany for Hungary, but were eventually arrested. Family members spent time in several Nazi concentration camps including Oranienburg and Dachau. With Duke Otto III of Lower Bavaria, who was a maternal grandson of Béla IV of Hungary and was elected anti-king of Hungary and Croatia as Bela V (1305–1308) the Wittelsbach dynasty came to power outside the Holy Roman Empire for the first time. Otto had abdicated the Hungarian throne by 1308. Christopher III of the House of Palatinate-Neumarkt was king of Denmark, Sweden and Norway in 1440/1442–1448, but he left no descendants. The House of Palatinate-Zweibrücken contributed to the monarchy of Sweden again 1654–1720 under Charles X, Charles XI, Charles XII and Ulrika Eleonora. The Wittelsbach princess Sophia of Hanover (1630–1714) was the mother of George I of Great Britain; she died as Heiress Presumptive of Great Britain a few weeks before the case of succession. The line of Jacobite succession is currently within the House of Wittelsbach. Franz, Hereditary Prince of Bavaria is recognised by the Jacobites as "Francis II". The Wittelsbach prince Otto of Bavaria was elected king of newly independent Greece in 1832 and was forced to abdicate in 1862. Queen Christina of Sweden abdicated her throne on 5 June 1654 in favour of her cousin Charles X Gustavus, a member of the Wittelsbach branch Palatinate-Zweibrücken. It was the second term for the rule of the House of Wittelsbach in Sweden since 1448 when Christopher III of the Palatinate branch was king of Denmark, Sweden and Norway. Sweden reached its largest territorial extent under the rule of Charles X after the Treaty of Roskilde in 1658. Charles's son, Charles XI, rebuilt the economy and refitted the army. His legacy to his son, Charles XII, was one of the finest arsenals in the world, a large standing army and a great fleet. Charles XII was a skilled military leader and tactician. However, although he was also skilled as a politician, he was reluctant in making peace. While Sweden achieved several large scale military successes early on, and won the most battles, the Great Northern War eventually ended in Sweden's defeat and the end of the Swedish Empire. Charles was succeeded to the Swedish throne by his sister, Ulrika Eleonora. Her abdication in 1720 marked the end of Wittelsbach rule in Sweden. King Otto I of the House of Wittelsbach was made the first King of modern Greece in 1832 under the Convention of London, whereby Greece became a new independent kingdom under the protection of the Great Powers (the United Kingdom, France and the Russian Empire). Throughout his reign, Otto faced political challenges concerning Greece's financial weakness and the role of the government in the affairs of the Church. The politics of Greece of this era was based on affiliations with the three Great Powers, and Otto's ability to maintain the support of the powers was key to his remaining in power. To remain strong, Otto had to play the interests of each of the Great Powers’ Greek adherents against the others, while not aggravating the Great Powers. When Greece was blockaded by the (British) Royal Navy in 1850 and again in 1853, to stop Greece from attacking the Ottoman Empire during the Crimean War, Otto's standing amongst Greeks suffered. As a result, there was an assassination attempt on the Queen and finally, in 1862, Otto was deposed while in the countryside. The law of succession to the throne of Greece was defined by a supplementary article to the convention of 7 May 1832 awarding the Greek Throne to Otto I. It instituted a semi-salic order with an important rule preventing the union of the crown on the same head with any other crown, especially that of Bavaria. Under the terms of the succession law, a Wittelsbach claim to the throne would have passed on Otto's death in 1867 to his younger brother Luitpold, who was regent of Bavaria from 1886 to 1912; and after him to Ludwig who became king Ludwig III of Bavaria in 1913. At this point, tracing the claim becomes impossible as the same branch of the Wittelsbach became heir to both thrones, and a subsequent monarch or pretender should have issued a renunciation to one of the two thrones, which none did. In the end, neither Luitpold nor his son Ludwig actively pursued a claim to the Greek throne inherited from Otto I, and the throne of Bavaria itself disappeared in 1918, leaving the future of the claim to be decided by a further arrangement that never occurred. Joseph Ferdinand, a son of Maximilian II Emanuel, was the favored choice of England and the Netherlands to succeed as the ruler of Spain, and young Charles II of Spain chose him as his heir. Due to the unexpected death of Joseph Ferdinand in 1699 the Wittelsbach did not come to power in Spain, leaving the Spanish Succession uncertain again. Many women in the family are known as Elisabeth of Bavaria. Duke Franz's patriline is the line from which he is descended father to son. Patrilineal descent is the principle behind membership in royal houses, as it can be traced back through the generations. From 1597 to 1794, Bonn was the capital of the Electorate of Cologne and residence of the Archbishops and Prince-electors of Cologne, most of them belonging to the Bavarian branch of the House of Wittelsbach (from 1583 to 1761). A full armorial of the Wittelsbach family can be found on the French-language Wikipedia at Armorial of the House of Wittelsbach. Electoral Palatinate, County Palatine of the Rhine from 1215 to 1623. Quarterly 1 and 4 sable, a lion or, armed, langued and crowned gules, 2 and 3 fusilly bendwise azure and argent. 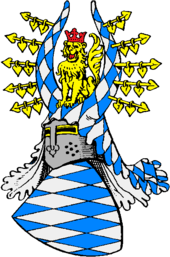 Heraldic augmentation for the Count Palatine of the Rhine, a prince-elector of the Holy Roman Empire: Quarterly 1 and 4 sable, a lion or, armed, langued and crowned gules, 2 and 3 fusilly bendwise azure and argent, overall gules, an orb or encircled of the same. Rupert of Germany (1352 † 1410), king of the Romans from 1400 to 1410. Or, an eagle sable, membered, beaked and langued gules; overall quarterly 1 and 4 sable, a lion or, armed, langued and crowned gules, 2 and 3 fusilly bendwise azure and argent. Frederick V, Elector Palatine (1596 † 1632), elector palatine from 1610 to 1623 and king of Bohemia from 1619 to 1620. Quarterly of six, three rows of two, 1 gules, a lion argent, queue fourchée in saltire, crowned, armed and langued or (Bohemia), 2 azure, an eagle chequy of argent and gules, beaked, langued, membered and crowned or (Moravia), 3 or, an eagle sable, armed, beaked and langued gules, on its heart a crescent below a cross argent (Silesia), 4 barry of six argent and azure, a lion gules, queue fourchée in saltire, armed, langued and crowned or (Luxembourg), 5 per fess embattled azure and or (Upper Lusace), 6 argent, a bull gules issuant from a terrace vert (Lower Lusace). Overall per pale sable, a lion or, armed, langued and crowned gules (Palatinate) and fusilly bendwise azure and argent (Bavaria); grafted in point gules, an orb or, which is the heraldic augmentation for the archsteward of the Holy Roman Empire. Counts Palatine of the Rhine from 1648 to 1688. Quarterly 1 and 4 sable, a lion or, armed, langued and crowned gules (Palatinate), 2 and 3 fusilly bendwise azure and argent (Bavaria), overall gules, a crown of Charlemagne or, which is the heraldic augmentation for the archtreasurer of the Holy Roman Empire. Counts palatine of Neuburg from 1574 to 1688. Counts palatine of Sulzbach from 1688 to 1795. Quarterly of eight, two rows of four, 1 fusilly bendwise azure and argent (Bavaria), 2 or, a lion sable, armed and langued gules (Juliers), 3 gules, an escutcheon argent surmounted by an escarbuncle with rays or (Cleves), 4 argent, a lion gules, queue fourchée in saltire, armed, langued and crowned or (Berg), 5 argent, a lion azure armed, langued and crowned or (Veldenz), 6 or, a fess chequy argent and gules of three rows (de la Marck), 7 argent, three chevrons gules (Ravensberg), 8 argent, a fess sable. Overall, a lion or, armed, langued and crowned gules (County palatine of the Rhine). Electors palatine of Neuburg from 1688 to 1742. Per pale, I quarterly 1 sable, a lion or, armed, langued and crowned gules (county palatine of the Rhine), 2 fusilly bendwise azure and argent (Bavaria), 3 argent, a lion azure armed, langued and crowned or (Veldenz), 4 or, a fess chequy of three rows argent and gules (de la Marck), II per fess, the chief tierced in pale, the base per pale: 1, or, a lion sable, armed and langued gules (Juliers), 2 gules, an escutcheon argent, surmounted by an escarbuncle with rays or (Cleves), 3 argent, a lion gules, queue fourchée in saltire, armed, langued and crowned or (Berg); 4 argent, three chevrons gules (Ravensberg), 5 argent, a fess sable. Overall gules, a crown of Charlemagne or (Arch-treasurer of the Holy Roman Empire). Counts palatine of Zweibrücken from 1569 to 1675. Per pale, I quarterly 1 and 4 sable, a lion or, armed, langued and crowned gules (county palatine of the Rhine), 2 and 3 fusilly bendwise, azure and argent (Bavaria); overall argent, a lion azure armed, langued and crowned or (Veldenz); II quarterly of six, two rows of three, 1 or, a lion sable, armed and langued gules (Juliers), 2 gules, an escutcheon argent, surmounted by an escarbuncle with rays or (Cleves), 3 argent, a lion gules, queue fourchée in saltire, armed, langued and crowned or (Berg), 4 or, a fess chequy of three rows, argent and gules (de la Marck), 5 argent, three chevrons gules (Ravensberg), 6 argent, a fess sable. Quarterly, a cross paty or, which is the cross of Saint Eric, cantonned 1 and 4, azure, three crowns or, two and one (Sweden moderne), 2 and 3 azure, three bars wavy argent, a lion crowned or, armed and langued gules (Sweden ancien). Overall quarterly Bavaria, Juliers, Cleves and Berg, inescutcheon sable, a lion or, armed, langued and crowned gules (County palatine of the Rhine). Counts palatine of Birkenfeld from 1569 to 1795. Per pale, I quarterly 1 and 4 County palatine of the Rhine, 2 and 3 Bavaria; II quarterly 1 Veldenz, 2 chequy gules and argent (de Birkenfeld), 3 argent, three escutcheons gules, two and one (Rappolstein), 4 argent, three heads of eagles sable, crowned or, two and one (de Hohenach). Quarterly 1 sable, a lion or, armed, langued and crowned gules (County palatine of the Rhine), 2 per fess indented gules and argent (Franconia), 3 bendy sinister argent and gules, a pale or (de Burgovie), 4 argent, a lion azure, armed, langued and crowned or (Veldenz). Overall, Bavaria. Otto de Wittelsbach (1815 † 1867), king of Greece. Quarterly, County Palatine of the Rhine, Franconia, de Burgovie, de Veldenz. Inescutcheon, Bavaria. In chief, gules, a cross argent. Louis IV (1286 † 1347), king of the Romans in 1314, emperor of the Holy Roman Empire in 1328. Or, an eagle sable, membered, beaked and langued gules, inescutcheon fusilly in bend azure and argent. Dukes of Bavaria and Electors of Brandenburg : Louis V († 1361), Louis VI († 1365) and Otto V († 1379). Per pale fusilly in bend azure and argent, and argent, an eagle gules, armed, beaked and langued or. Duke of Bavaria-Straubing, Counts of Hainaut and Holland from 1254 to 1433. Quarterly 1 and 4, fusilly in bend, azure and argent, 2 and 3, grand-quarterly I and IV or, a lion sable, armed and langued gules, II and III, or, a lion gules, armed and langued azure. Electors of Bavaria from 1623 to 1777. Quarterly 1 and 4 fusilly in bend, azure and argent, 2 and 3 sable, a lion or, armed, langued and crowned gules, overall gules, an orb crucifer or. Charles VII (1697 † 1745), Holy Roman Emperor from 1742 to 1745. Or, an eagle sable, membered, beaked and langued gules; inescutcheon quarterly 1 and 4 fusilly in bend, azure and argent, 2 and 3 sable, a lion or, armed, langued and crowned gules, sur le tout gules, an orb crucifer or. ^ Manfred Berger (2003). "Rupprecht, Maria Luitpold Ferdinand, Kronprinz von Bayern, Pfalzgraf bei Rhein, Herzog von Bayern, Franken und in Schwaben usw.". In Bautz, Traugott (ed.). Biographisch-Bibliographisches Kirchenlexikon (BBKL) (in German). 22. Nordhausen: Bautz. cols. 1173–1186. ISBN 3-88309-133-2. ^ François Velde (30 April 2005). "The Succession Laws of the Greek Monarchy". Heraldica. Retrieved 31 May 2010. ^ a b c d Héraldique Européenne : empereurs. ^ Héraldique Européenne : Bohême. ^ Par déduction. En 1648, le fils de Frédéric V recupère une partie des terres paternelles, le titre d'électeur, confisquées en 1623, et la charge d'archi-trésorier du Saint-Empire. Il paraît logique de penser qu'il ajoute l'écu de cette charge sur ses armes. Wikimedia Commons has media related to House of Wittelsbach. Marek, Miroslav. "Genealogy of the House of Wittelsbach from Genealogy.eu". genealogy.euweb.cz (Genealogy.EU).